(Newser) – The world's richest man doesn't know how his racy text messages to Lauren Sanchez ended up in the National Enquirer—but he can afford to hire private investigators to find out. Gavin de Becker, longtime security chief for Jeff Bezos, is leading the privately funded investigation. He tells the Daily Beast that one of the people the investigation is looking at is Sanchez's brother, Michael Sanchez, a President Trump supporter whose associates include Roger Stone and Carter Page. De Becker says the investigation is ongoing, but "strong leads point to political motives." 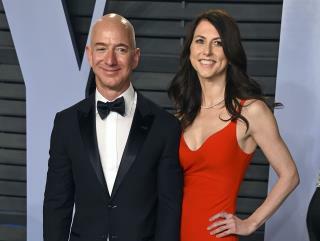 Trump has often criticized the Amazon CEO and mocked him as "Jeff Bozo" after Bezos announced his divorce in early January. Isn't it a crime to access and steal anything that doesn't belong to you? If he accessed his sister's phone and took the information, I don't see how that's any different than stealing a letter from her home. Famous with money, women. They’re all going to go after Bezos. Trump is jealous like a can of dirty worms. And a 70+ child.